This model supports the wrist and provides adjustable assistance into MP extension, and a thumb attachment provides thumb stability or assistance into extension. 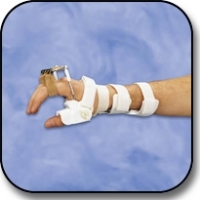 This wrist extension splint is low profile, lightweight and easy to apply. Tension may be adjusted at hinge. Weight: 6 oz. Measure width of hand at MP joints in inches. If the hand measures between sizes, order the larger size. #401BL - Small, 2-1/4\" to 2-3/4\"
#401BR - Small, 2-1/4\" to 2-3/4\"
#401CL - Medium, 2-7/8\" to 3-1/4\"
#401CR - Medium, 2-7/8\" to 3-1/4\"
#401DL - Large, 3-3/8\" to 3-3/4\"
#401DR - Large, 3-3/8\" to 3-3/4\"